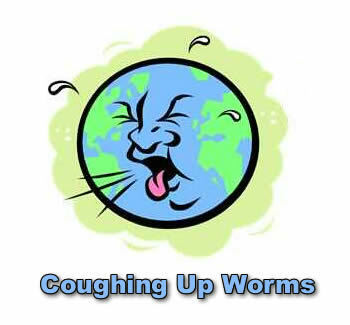 Have you heard about coughing up worms in the lungs??? What kind of worm that gets into the lung causing one to cough up small, very bright, hot pink spots and little glass like balls with two black cells? I don't know what specific parasite worm it would be that would cause you to cough up that specific description of hot pink spots with glass like balls and two black cells. Some of the most common worms in lungs would be helminths, like roundworm, tapeworm, hookworm, and threadworm. Are you certain that it is a worm that you have in the lung? Have you been to a doctor for testing? Garlic - naturally anti-fungal and anti-parasitic. You can eat raw garlic, or use garlic supplements like Bear Paw Garlic. Probiotics - good bacteria that helps your body fight against parasitic worms, etc. My favorite brand is Florafood, but any good quality probiotic may be used. Herbs for killing the parasites and flushing them from the system. Para 90 and Herbal Fiberblend are your best options. Well, those are the supplements I'd use myself if I were coughing up worms or in fact anything that I felt was infecting my lungs or organs. I particularly use the Herbal Fiberblend for cleansing my body of any type of bacteria or germ I may have picked up along the way. I've had excellent success with HFB and I've also received great feedback from those who have followed my suggestion and have tried it themselves. I hope you find some of this information helpful to you and you can get rid of this very strange and serious concern.